Look, the ATV National Motocross Championship is not boasting the deepest field of contenders these days. I've followed this series for a long time, and it can proudly boast of having two heydays, first, the mid-eighties, when the manufacturers were selling the crap out of three-wheelers and transitioning to four-wheelers. Factory rides were around, and the pay and racing got so good that some solid fringe privateer dirt bike racers switched over to ATV racing. Can you imagine guys jumping off Privateer Island and going ATV racing these days? Is Seven Deuce Deuce's quad too lit? By 1988, though, the Consumer Product Safety Commission was all over the three-wheeler's little safety "problem," and the manufacturers were getting really, really scared. They entered a consent decree with the U.S. government, which included the banning of three-wheeler sales, as well as many steps to keep little kids off of adult-sized four-wheeled ATVs and more. I don't believe it was ever uttered in public, but there's no doubt the manufacturers also grew very afraid of supporting ATV racing. By 1989, the series was full privateer. The money had dried up. But the crazy thing is, these crazy quad bastards just kept on racing! Development of sport/racing style quads froze in 1989, so everyone just took the best machine from that year, Honda's famous TRX250R, and just kept working on it. Eventually, I think the only thing left on the race machines that came on the Honda were the engine cases. It had to kill these guys that the Honda name was cast right into the side of the engine case, considering how much money they were spending to modify the machines with zero coming back from the manufacturer. In fact, I bet someone actually figured out a way to build new side cases under the guise of more oil volume or something, while making sure to get that Honda logo off of there. Amazing job by the ATV motocross enthusiasts to keep the ball rolling. It was a labor of love for about 15 years, until, amazingly, the persistence paid off! In the mid-2000s, the manufacturers suddenly decided ATV racing was okay again. They all introduced 450 four-stroke racing machines, and factory teams returned! It got real. Suzuki, Honda, Yamaha, and Kawasaki supported riders in the series, then Can-Am jumped in with a 450 machine of its own, and for a brief moment AMA ATV MX had just as many brands supporting factory riders as AMA motocross and supercross. And just like that, it stopped again. 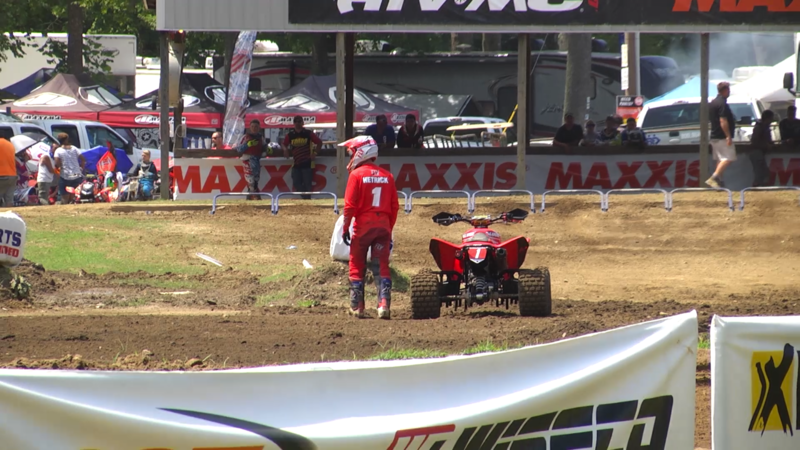 Yamaha still backs Chad Wienen in the series to some degree, and I think Joel Hetrick maybe gets some help from Honda. They both have manufacturer logos on them, but that's it. Further, the 450 race quad market has slammed shut again. Honda no longer sells its TRX450. Actually, Yamaha is the only brand left actively pitching a 450 race quad. So year by year, title contenders have drifted from the series, usually into retirement. Begging the factories to come back, only for them to actually do so and leave a second time, has to feel like getting dumped by your dream girl twice. So, some dudes just stopped dating. Wienen is the lone survivor from the glory days (he rode for factory Suzuki, Can-Am, and Kawasaki before his Yamaha deal), while Hetrick has come through the amateur ranks at, well, not at the very best time. He's probably the fastest guy in the series now, but it took forever to get past Wienen to win the title because Wienen never makes mistakes, and the way the field is now, he will basically never, ever finish worse than second. Wienen makes Ryan Dungey look like Evel Knievel. He has not finished off the podium in SEVEN YEARS. So Hetrick can win a lot of races, but he can barely build a points lead over the ridiculously-consistent Wienen, and if he falters, Wienen snags the win and gets points back. Last year, Hetrick finally broke through to end Wienen's five-year championship streak. Coming into the weekend's season finale at Loretta Lynn's, Hetrick had it in hand. He entered the race with a nine-point lead over Wienen. That's not much, but these guys generally finish 1-2 in every moto, so it's plenty (shoutout to Thomas Brown and Jeffrey Rastrelli, who will get in there if Wienen or Hetrick really screw up). Essentially, the way the field is now, Hetrick's nine-point lead felt like an 18-point lead. So, knowing that, the only way he could lose the title was with a crash or a mechanical failure. And we know, as often as we tease crazy title scenarios leading into the last race, that stuff basically never happens. Until it did. 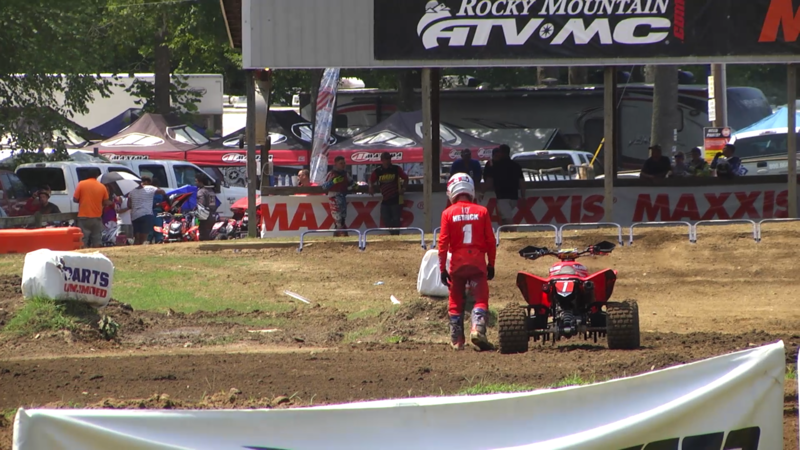 Hetrick's chain broke in moto one at Loretta's. He DNFed, and Wienen took the points lead. Hetrick came back to win moto two, but it didn't matter. A broken chain in the finale ruined Hetrick's title hopes.